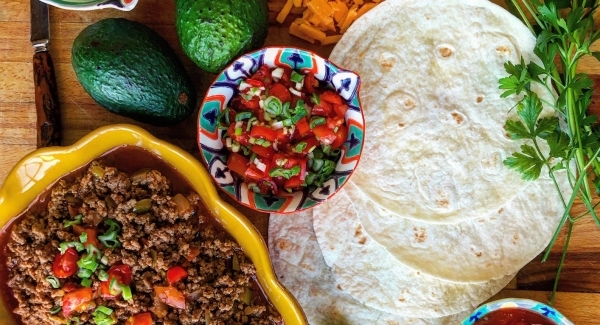 Yesterday was National Taco Day and I had this post all ready so you guys could all have everything you need to have a taco party on Taco Day. But, we live in a time where access to the internet is vital for business aaaand, also, people don’t know how to drive. What does that have to do with anything, you ask? Well, someone drove into the phone lines on our street and left us without internet for two days. But, my motto lately has been “it is what it is”…so y’all will have to have your taco party next week (because if you’re Canadian, this weekend is all about Thanksgiving!!). And of course no party is a party without dessert! How about making these quick and easy ice cream tacos to finish off your fiesta?? So you get it right?? Whatever filling is calling your name, make this buffet style party the backdrop of your next gathering! It can be as easy or difficult as you like…make your own guac or by some at the store…make your own salsa or pick up a jar at your local grocer…forgot sour cream? Use some leftover tzatziki you have in the fridge…you get it right? Pick up some tortillas, lay out the extras, cut up some lime, put out your filling and keep the beer flowing. Now send me your address and I’ll be right over!! No more store bought taco seasoning (which, by the way, is full of things you really don't want to know about!!). This one is easy to put together and keeps for a really long time! !